Reliable detection of foodborne pathogen is of great importance in guaranteeing food safety. In the present work, based on the multifunctional properties of platinum-coated gold nanorods (AuNR@Pt), we developed a dual-mode aptasensor based on inner filter effect (IFE) and color change strategies and applied it for Vibrio parahaemolyticus (V. parahaemolyticus) detection. Under optimal conditions, in the range of 5 × 101–107 cfu/mL and 102–106 cfu/mL, the concentration of V. parahaemolyticus exhibited good linear relationship (R2 = 0.9898 and 0.9844) with changed fluorescence signal intensity and color signal intensity, respectively. In addition, the practicability of the novel aptasensor was successfully validated by detecting different concentrations of V. parahaemolyticus spiked in tap water and shrimp samples. With its satisfactory performances, this aptasensor is expected to be a promising candidate for determining V. parahaemolyticus. 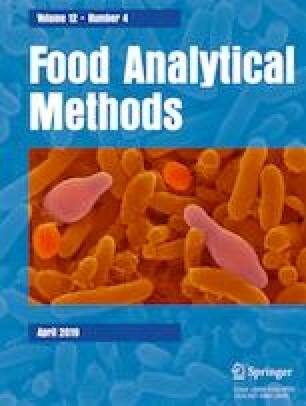 This assay could also be extended for the analysis of other targets (pathogens or harmful substances) in food products by using the corresponding aptamer. This research was supported by the Natural Science Foundation of Shandong Province (ZR2018BC064) and Special Funds for Taishan Scholars Project.